This goes out to all you Minivan Moms and Dads. Seriously. What’s up with dissin’ the Mini? Pride in the Ride. These wheels are smoooooth. They drive like butter, turn on a dime, and fit all five of our kiddos snug as a bug (okay – maybe more like sardines – but that’s not Honda’s fault). I can walk back to my peeps as if I were on a bus, our BOB double stroller fits perfectly in the huge rear storage space and the “press-one-button-to-slide-open-the-doors-while-I-carry-a-car-seat-in-each-arm” feature sold me in three seconds flat. Not to mention I don’t have to worry about my kids dinging the porsche next to us as they open the doors. In my pre-maternal life I loathed the thought. But now I’m all about the mini (except when we can’t get up my parents’ street after a snow storm). The rest of the time, it’s blissful. Me and the Odyssey. A match made in heaven. My friend Kelly sent me this Toyota commercial today. Having just read about Jennie’s “Loser Cruiser” over at Segullah and with Mother’s day tomorrow, it was a no-brainer. Had to post. As for the mini, who’s got my back? I swore I would NEVER have a minivan. But they are the best. Better gas mileage (at least compared to the Suburban we had for a little while) and they can have good get up and go. Way more room and access for kids and all the stuff. Take out the seats and you've basically got a truck bed for hauling stuff. Plus, and this is a HUGE plus -sliding doors. Once your kids can get in and out themselves, you don't have to worry about them swinging the doors open and dinging someone's Beamer at the grocery store or against the wall in garage, or your other car. We are sooo beyond that :> Loved it! that was funny. I like the swagger wagon. Oh, this is so perfect for me to show Bruce right now. He is totally aghast that we have reached the "van" stage in our family. Maybe this will ease the pain for him. As for me, I'm with you: vans are the best for SO MANY reasons! Can't dis the mini! Melissa – right on. You know your mini features. And the gas mileage – good point! I'm with you – we should never say NEVER! Jana – How fun to see a comment from you! So glad you're in the mini club. How ARE those six little ones of yours?? Do you still fit in the mini? 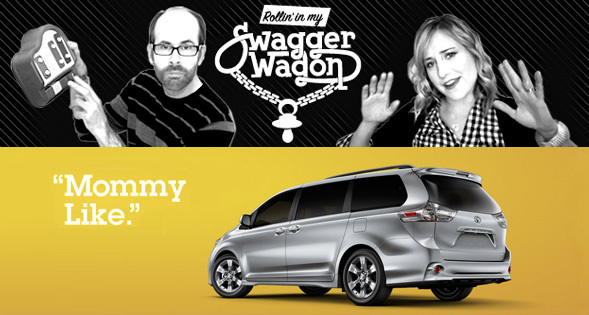 Sarah – Would Lance go for a swagger wagon? Steph – Yes – must show Bruce. Surely this will up the cool factor for him. I mean – who wouldn't want to be like that guy?? The Mac! Yes, I too said I'd never own a van. But once you go there you can never go back. They rock my kid haulin world. Tiffany – can I use that? "They rock my kid haulin world." Straight ownin'. Loved your comment. Thanks my dear! I LOVE my minivan and will sing its praises anyday! cath…im having to hand in the face you on this one. i am a loather. but let me explain. we grew up with our "mini"…with 5 girls in our fam, it was appropriate. but as the 4th girl in the fam…as every one started to trickle to college…why were we still driving that mini…seriously it was beatdown. it barely went over 40, but we still drove it. just me, my mom and little sister. no strollers. no carseats. no air conditioning. but my dad said it was great to have the extra room to bring friends along or to help carpool and it was paid for. yeah but it wasnt so great when i turned 16 and had to drive the mini everywhere and everyone could hear me coming from 10 miles away…lol. seriously though, me & the mini had some great memories…and i use to pray every night it would get stolen…my senior year of high school, i came out of boys basketball game and low & behold…it was gone! to this day i dont know who took…it had to be some one close to me that knew i kept the keys in the ashtray. and low and behold the police found it, 3 days before the insurance kicked in. im glad you luv your mini. im sporting a honda pilot and feel good about it. ps…after i graduated…and went to college, my parents bought a montero suv…my little sister thought she was the bomb.com driving that thing around. Mimi- Hurray – I'm in a club with you! Hope you are doing well! Cami – Your comment had me busting up. No wonder you have issues with minivans. You had to drive a beater of one all through high school? Man. And I thought the burb was bad sometimes. And the fact that it actually WAS stolen? Hilarious. Glad you love your Pilot. A couple friends of mine have one and love it. Feelin' good in your wheels is important. I think minis just get such a bad rap, this is meager way of making ourselves feel better! 🙂 And really, it is all about the sliding doors. Loved hearing from you – hand in the face and all! I am in love with my mini. We have an odyssey too and the doors and the room and the drive……adore them all! I love reading your posts and I just read your writings in grandma's book about Christmas, it was wonderful and inspiring. Where are you guys moving? Cath (this is t-bone) I totally got your back. I've been trying to rock the mini since 2007! I'll get my wife to agree with me someday. For now, I'll just dream big (mini). T! I had no idea you were such an advocate for the cause. Your post is hilarious! Where in the world did you find that picture of the lades in the mommy jeans??? ACK! And I didn't know Corinne was so vehemently averse. A coma over the mini? We need to work on her! LOVED your comment! Can't dis the mini–you just end up being a fan by the sheer practicality of the thing. Maybe someday we'll branch out into something different, but hey, it's paid for, and these days I'm pretty pumped about that! Shelli – paid for? Oh yeah. Ride that train as long as you can sister!